I have taken some time out from business meetings in Europe to make something of a personal pilgrimage in the steps of my ANZAC ancestors. It has been a very moving and very sombre experience. To see the tiny spaces of land fought over in World War 1 that resulted in so many deaths is beyond tragic. It is sobering to realise that every death did not just kill the individual concerned, it had flow on effects to each family, town and country and that damage reverberated for generations. And for every survivor there was no counselling, no awareness of the physical and emotional damage they carried with them and shared with families and society throughout their lives. I toured the Somme and Ypres Salient with a French guide who combined a deep knowledge of the history of World War 1 with a gerat reverance for the sacrifices made by those who fought. Olivier Dirson of Chemins D’Histoire really helped me to understand what had happened both in battle and to the people around. One of the saddest places to visit is the Fourth Australian Division monument at Bellenglise. Sad because it is a monument to battles fought in 1918 and to sacrifices made so close to the end of the war. Yet also sad because, unlike the fine Somme American Cemetery and Memorial near Bony in Picardie, the Australian memorial is in the middle of farmers’ fields and can only be approached by a rough and muddy road. The stories of Somme mud are no joke. It is sticky and clumps-up on your feet and it is easy to see how walking through this mud could add several kilos to every step. In damp or snowy weather it is impossible to drive up to the Fourth Australian Division monument at Bellenglise. This is a national scandal! That Australia cannot even be bothered to ensure that those of us who would remember them can reach this memorial made me feel angry. How much would it cost to build a short paved road so that we can visit this site to remember the enormous sacrifices made by these men? “The presence of so many children and young men and women at ANZAC ceremonies is a stark reminder of the youth of those who fought for us. Look at them and wonder at the fears of their families, at their terror as they faced fierce fighting and watched their friends die. Listen to these words written to mark the evacuation in 1915, by a 23 year old Australian soldier-poet Leon Gellert, a combatant at Gallipoli. And thus I mused and sorrowed wistfully. It seems appropriate this ANZAC Day to share a good online resource. Thus I commend to people the Australian National Archives site called Mapping our ANZACS. It provides a way to browse 375,971 records of service in the Australian Army during World War I according to the person’s place of birth or enlistment. Using this site I was able to find out about one of the missing uncles from my paternal grandmother’s side of the family. It was strange that in her family stories there was this uncle who was just a name. Nobody talked about him apart from the occasional mention of his name. 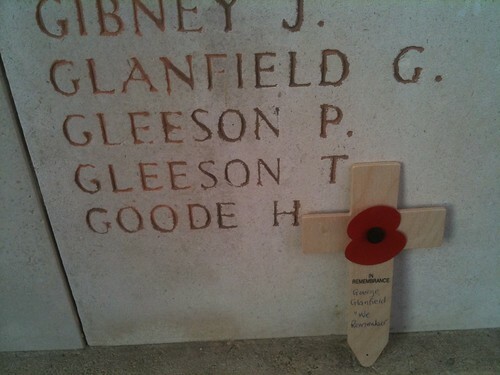 He was one of the many uncles around the world who fought and died during World War One. I suspect that the pain of their loss had not diminished, even after all that time. 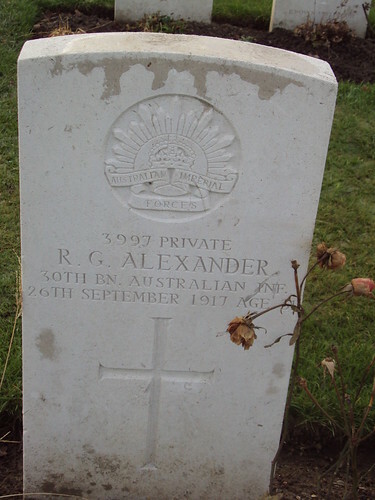 Rupert Alexander was 31 years old when he was killed in action on 26 September 1917. The records note merely that Rupert fell “in France or Belgium”. He had never married and had no children. He’d worked as a plate layer in a sawmill prior to enlisting. My grandmother once mentioned that Rupert had the family look about him, standing about 5′ 9″ tall with blue eyes and brown hair. His widowed mother received two pictures of his grave near Ypres in Belgium and a ‘victory medal’ from the authorities. Apparently she rarely spoke of him afterwards.